To confront the philosophical system of Rene Descartes is to contemplate a magnificently laid out map of human cognitive endeavour. 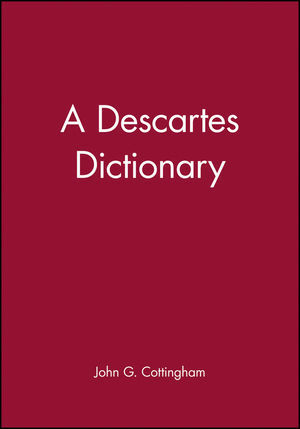 In following Descartes arguments, the reader is drawn into some of the most fundamental and challenging issues in all of philosophy. In this dictionary, John Cottingham presents an alphabetied guide to this most stimulating and widely-studied of philosophers. He examines the key concepts and ideas in Cartesian thought and places them in the context both of the seventeenth-century intellectual climate and of subsequent interpretation. The entries range over a wide variety of areas including cosmology, physics, theology, psychology and ethics. The book is designed to appeal to the newcomer to Descartes, whether student or general reader, while also providing detailed critical comment and precise textual references for the more advanced reader. Also included are a general introduction describing Descartes' life and works, and bibliographic guide to the Cartesian texts and the mass of interpretative literature on Descartes. John Cottingham is Professor of Philosophy at the University of Reading. His book include Descartes (Blackwell, 1986) and The Rationalists (OUP 1988) and he is also editor of the The Cambridge Companion to Descartes (CUP, 1992) and co-editor and co-translator of the English edition of The Philosophical Writings on Descartes (CUP, 1985-91).